Given that the Mystery Villain is Reed Richards, it's clear that by allowing himself to be captured by Johnny's flaming cage, he's just humouring his young brother-in-law-to-be. Especially as he doesn't immediately walk through the non-bars of the non-cage and continue the fight. Still, at least this panel marks our last excerpt from this terrible, terrible comic. Check out our coverage of Strange Tales #127 on our thirty-seventh episode: Yes, Mr Lister, Sir! I feel like the ridiculousness of Johnny being able to flame on underwater has already been covered, so let's give a quick examination to his activities, and answer the burning question (pun intended): Can you make steam underwater? I looked at three pages of google search results, and the answers were inconclusive. Although I do have some good recommendations for subaquatic computer games available on an online game distribution platform. The conceit of this issue has the Fantastic Four battling to save Namor and Atlantis from invasion by Attuma, but without Namor ever knowing that he had assistance. To save time getting the team underwater, and to do so without giving them lots of breathing equipment, the creators come up with an aerosol spray that allows them to breathe underwater. But breathing is one thing - what about Johnny's flaming powers? Thankfully, Reed's oxo-spray also resolves this. Thanks to the extra oxygen which has permeated his skin (and definitely not been used in any metabolistic reactions), Johnny can now flame on underwater (and extra-flame on out of water). As the title of this trope states, flamin' 'eck. Normally, I'm calling Johnny out for unlikely or downright stupid uses of his flame powers. Today, I'm crediting Johnny with using some intelligence. Thankfully, this is Fantastic Four issue - I point blank refuse to credit Strange Tales Johnny with any intelligence whatsoever. Having been tasked with scouting the New York coastline for unusual marine activity - a job resulting from the discovery of an unknown underwater creature from the deepest part of the ocean, which makes me think that this is less 'critical reconnaissance' and more 'keep the boy busy' - Johnny notes that it's getting dark, and sets up some flares to help him search. It's not showy, it's grounded in as much realism as you can expect from 1960s Marvel, and it's good. Lettered by Sam Rosen, Letterer of… Patsy Walker?!! I can give a pass to Johnny using his flame to create a giant '4' logo above the centre of New York to summon the nearby members of the team. I'm a lot less likely to do the same for an entire message, written in the sky above the centre of New York, that can be read all the way out in Forest Hills. When a lot of plot needs to happen, there often isn't room for tropes to make an appearance. In the intervening pages, a mysterious figure has arrived from space, taken the place of the incarcerated Franklin Storm (sending him to outer space for safe-keeping), broken free from prison, assumed the identity of the Invincible Man, and started attacking downtown New York. How could this villain possibly be stopped? With giant flaming staves, that's how! Staves! Made of fire! With totally physical properties that prevent movement! For sure! I feel that the repeated dunking and denying Johnny of his powers through wetness (both literal and metaphorical) shows the problem with having Namor as the antagonist in a flame-powered character's solo strip. If Strange Tales hadn't evolved into having The Thing as a permanent guest star, it's hard to imagine how the Human Torch could have achieved anything in this story. Unfortunately, Marvel hadn't yet progressed to the point where they could willingly lampshade Johnny's uselessness, so even with Ben Grimm around to carry the action, everything's still played depressingly straight. I need to talk about Johnny's power usage, however, as it's one of the most brutal and disturbing examples of what the Human Torch could (but almost always chooses not to) do. Johnny uses his heat to directly burn Namor's shoulders, shrugging off as 'king-size sunburn' what is actually a nasty contact burn. I'm rather glad this is an aberration, rather than the start of something regular. So, Johnny's flame powers are so weak that he cannot dry his uniform without assistance from the sun. At the same time, his flame is so strong that it can cause intense temperature change through dozens of feet of sea water, disintegrating the sea kelp that the Thing had been trapped within, and forcing Namor to retreat? And... we're back. After nearly a full year, in which we've launched a Patreon, set up a new website, started regular comic reviews, and continued on our mission to cover every Fantastic Four comic ever printed, the Fantastic Four tropes blog (formerly the Fantastic Flame On) is back. A huge thanks to every Patreon supporter who helped us get to our milestone goal that included the return of the blog. We'll be producing new content three times a week (Monday, Wednesday and Friday). Every now and again, we'll mix things up with the continuing Guardians of the Galaxy reviews, and there'll be some special posts next week to coincide with our 200th episode. But these aside, it's time to get back to the mission of covering every Flame On, and more. We were in the middle of Strange Tales #124, in which the Human Torch and The Thing found themselves battling Paste-Pot Pete. As the story continued, the two inevitably found themselves defeated and entrapped by the superior abilities of paste. With paste outmanoeuvring them at every turn, there can only be one way to cancel out the all-conquering paste. Yes, the only way that the clearly unbeatable paste can be beaten is with Johnny creating a a flaming arrowhead and hurling it at Paste-Pot Pete's paste tube, denying him his fight-winning paste. Well, hurrah and huzzah for Johnny's improbable flame powers! The infamous panel where Johnny inadvertently proves and disproves the theories regarding conservation of energy. Ignoring the fact that the kinetic motion of the car's engine provides the energy to recharge the battery which is used to start the car itself, Johnny decides that he can expend his flame whilst creating new flame energy to store within him to use in the future. He's literally creating energy out of nothing. Sometimes, Stan's pseudo-science hits the right level of believability. Other times, it's pure crap. As we make our way through the final 10-or-so issues of Johnny Storm's solo adventures in Strange Tales, we're going to see logic (not a quality seen in abundance, admittedly) become scarcer and scarcer. Here's a good example of a panel which should never have been drawn, and which should have been picked up by anyone involved in the creative process from the penciling onwards. Having had half of his house destroyed by The Thing's refusal to use the front door, Johnny then decides to some on-the-spot spot-welding to repair the damage. So, he uses his intense heat and flame to repair his very obviously wooden house. Our streak of The Thing destroying everything in his wake continues as we return to our favourite Silver Age punching bag, Strange Tales. This opening sequence sees Ben decide to give Johnny a wake-up call by... er... lifting a side of his house off its foundations, presumably destroying the structural stability of the house. Judging by the way that rear wall doesn't change angle, there has to be a massive gaping crack somewhere along the side of the house as well. As Andy most likely said at the time, this makes no sense. And it still doesn't. We've also got yet another flaming lasso, easily my least-favourite thing in the entirety of Strange Tales (and beyond, as evidenced by its appearance in the comic covered on this week's episode). At least this is 1964, and we can pretty much guarantee that the walls are lined with asbestos, explaining why Johnny can throw his flame around in such a cavalier fashion. Our look at the debut of The Beetle concludes here. Johnny gets a 'Flame On' so underwhelming that I wonder if anyone involved in that panel remembered that this was a catchphrase. Sam Rosen gets some credit for using a heavier brush stroke for these words, but it barely stands out at all. More interesting is the unusual use of flame that comes from this, as Johnny creates a ring of fire where the Beetle is burrowing away. The wheel excavates the area, exposing the villain. I'm calling it our because earlier in the story, the Beetle had no problem flying or using the asbestos on his armour to withstand the heat. Here, because there's only one page of story left, he just decides to give up and submit to the teen hero. Can you imagine how ineffective Zemo's Thunderbolts would have been if he'd have recruited this version of The Beetle? We're currently recording episodes covering Fantastic Four comics from 1972. Strange Tales is long-gone, and despite the wildly inconsistent quality of Stan Lee's writing during his brief return to the title, a lot of the tropes from the early days of the Fantastic Four are no longer relevant. Whilst I may miss the ridiculous usage of asbestos, I really don't miss the implausible uses of Johnny's powers. It was a bit hard to work out where this one was going. The Beetle decides to defend himself against the Thing's wall-based attack by picking up a pot of hot soup, which was casually simmering away, and hurling it at Ben. Johnny decides to step in and, instead of evaporating the soup with his flame, he instead chooses to absorb the heat from the water, making it cold. It's an unusual choice, and depicted poorly by Burgos. Is that soup, or is it lava? Is it heading for Johnny, to extinguish his flame, or to Ben, to presumably burn him? Either way, battling against a vat of Campbell's Condensed hardly makes for one of the most riveting Human Torch battles. As I'm going through this story, I'm finding that I have absolutely no recollection of it. I don't remember the asbestos-lined caravan. I have no memory of the special shower which dries Johnny out by blasting him with steam. This story feels completely new to me. Sadly, this also means that I don't remember this moment where Johnny uses an asbestos rope - the same rope which previously caused his flame to die out instantly - to grapple one of his fireballs and... er... hurl it at one of the Terrible Trio. Quite why he needs to do this when he's previously been able to control his fireballs with an unlikely degree of accuracy is truly beyond me. For me, one of the best things about this period of Strange Tales is that the stories are so bland, there's very little for me to pull out and post. At least under the terms of this blog, otherwise the panel where Johnny, under attack from acorns, is extinguished whilst crying 'Too many of them! Covered in dew! So moist!' would be a definite contender. I'd attempt to recap the plot of this issue, but it's one of the most tedious of the Human Torch solo strips, so I won't bother. Instead, things have progressed to the point where Johnny feels that the Barracuda and his men are such lame villains that he can break out the flaming lasso and attempt to restrain them this way. Rather surprisingly, this works, although the lasso doesn't tighten, instead forming a floating wing at waist-height that the several of the thugs feel restrained by. 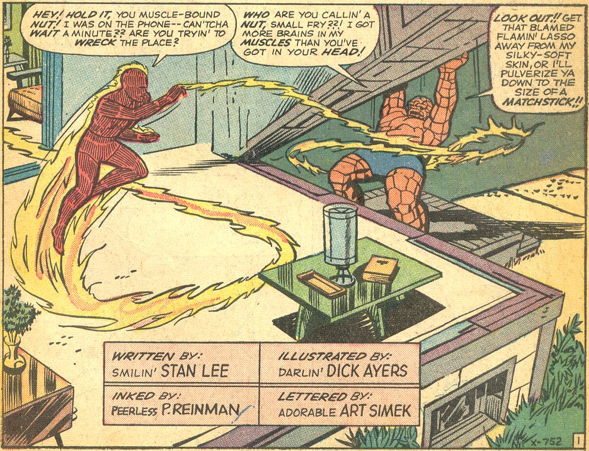 We're back to Strange Tales, as Jack Kirby draws his final Human Torch solo strip. It's not a great story, being notable for introducing the third-rate Sub-Mariner villain Barracuda, and teaming up the Human Torch with Iceman from the X-Men. If you've read the pre-Crisis story featuring the first meeting of Batman and Superman (the one on the cruise ship, brilliantly re-told in Superman/Batman Annual #1, with extra-added Deathstroke and Deadpool), then the basics of this issue will be very familiar. Of course, neither Superman nor Batman attempted to defeat the villain by hurling fireballs seemingly at random towards the wooden deck they were standing on, being unable to generate fire from their bodies, and having a health respect for the flammability of wood. Even with Iceman on hand to extinguish any stray flames, it seems like an incredibly stupid thing for Johnny to do. With the Wizard making his escape into the skies, Johnny decides to use a flame lasso to try to catch him. We'll leave aside the physical logistics of using a lasso comprised of flame, and instead look at the logistics of using a lasso in this situation. Based on the relative size of the Wizard, he must be at least a quarter of a mile away from Johnny. Even if Johnny had the skill to successfully land a lasso, could he do so over such a distance? Well, of course the plan fails - he misses, and the Wizard floats helplessly into the sky, where he'll suffer a horrific Silver Age death. Meaning that we'll assume he dies but find out in a flashback in a different title the unusual coincidences that led to his survival.